The term integrative medicine was adopted by leading human clinical and research programs in recognition of the significant overlap between conventional specialties and other therapies. The National Institutes of Health defines integrative medicine as the incorporation of complementary (nonmainstream) approaches into “mainstream” health care and, as such, the list of potential therapies within the field is extensive. 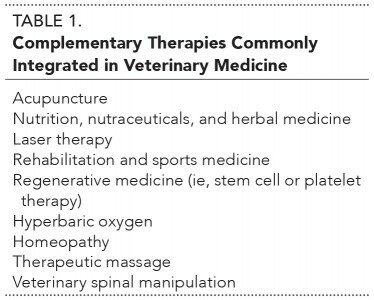 Integrative medicine services in veterinary hospitals include various combinations of therapies (Table 1). Other terms, such as holistic and alternative medicine, have been used to describe integrative therapies. However, holistic medicine suggests that conventional medical approaches do not account for the whole of a patient’s health, while alternative medicine implies that its therapies are outside, and separate, of conventional medicine. Therefore, neither term describes a system of medicine that incorporates efficacious aspects of conventional and complementary care. Human patients have increasingly used integrative medical approaches in the past 2 decades,4 and it is theorized that these patients may also pursue integrative approaches for their pets. 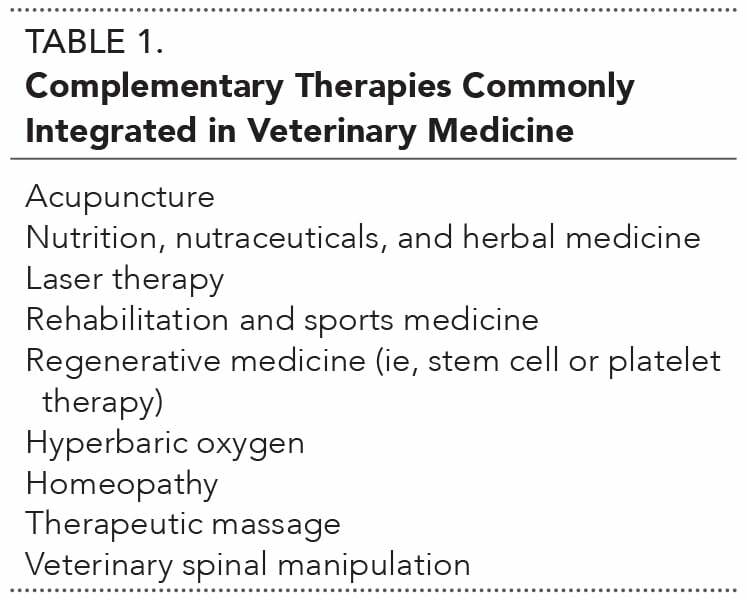 In humans, the use of integrative therapies has particularly increased in certain patient populations: nearly 50% of human oncology patients use complementary therapies as part of their treatment protocols, and a veterinary study found a similar prevalence in pets nearly a decade ago.5,6 Increased research is necessary to better define the demand and current utilization of such therapies in veterinary medicine. About 1∕3 of their acupuncture clients used the practice for routine care after initially visiting the practice for their first acupuncture appointment. The mean pet expenditures of both types of clients were similar, refuting the idea that only those with increased discretionary income elect acupuncture treatment. Homeopathy: A medical system in which dilute remedies are given, based on an underlying principle that “like treats like” and that more dilute agents are more potent. The stock solutions are generally derived from agents that, in high doses, would cause the clinical signs a patient displays. The science of homeopathy is subject to significant controversy as many of the most potent remedies contain no molecular trace of the stock compound. More information is available from the Academy of Veterinary Homeopathy (theavh.org). Herbal medicine: Herbs are often included in many traditional medical systems, and are scientifically studied in an emerging field known as ethnopharmacology. Controversies surround the safety and efficacy of such products. Several private organizations certify veterinarians in different types of herbal medicine. Additional information is available from the Veterinary Botanical Medicine Association (vbma.org) and Chinese medical organizations, such as the American Association of Traditional Chinese Veterinary Medicine (aatcvm.org) and International Veterinary Acupuncture Society (ivas.org). Therapeutic massage: This modality is commonly considered part of rehabilitation and sports medicine, but it may be practiced by nonveterinarians in some states. Several private certifications for nonveterinarians and veterinarians exist, and many rehabilitation certification programs discuss this modality. Veterinary spinal manipulation therapy (VSMT): This modality is similar in some ways to human chiropractic treatments, although in many states that name is reserved for licensed chiropractic professionals. There are different schools and styles of VSMT practice, but many promote the concept of joint subluxation to explain reported effects. Several scientific veterinary reviews are published, but much of this focuses on equine practice. Additional information is available from the American Veterinary Chiropractic Association (animalchiropractic.org). Note: The author does not practice or possess training in veterinary homeopathy or veterinary spinal manipulation. Many practices have effectively managed to incorporate integrative therapies, while others have struggled even after a significant investment of time and resources. Therefore, each practice must evaluate a number of variables before offering integrative therapies. FIGURE 1. 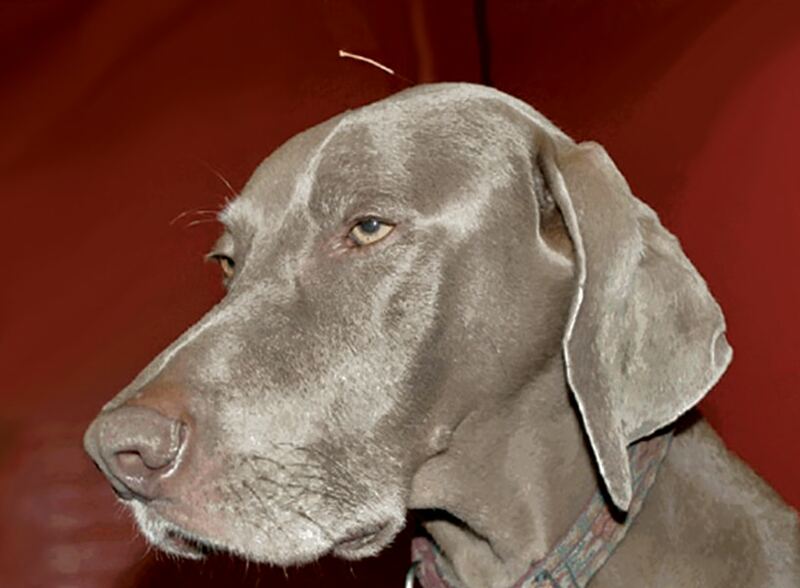 An acupuncture needle has been placed in this Weimaraner at GV-20, a common acupuncture point that is associated with sedation. FIGURE 2. 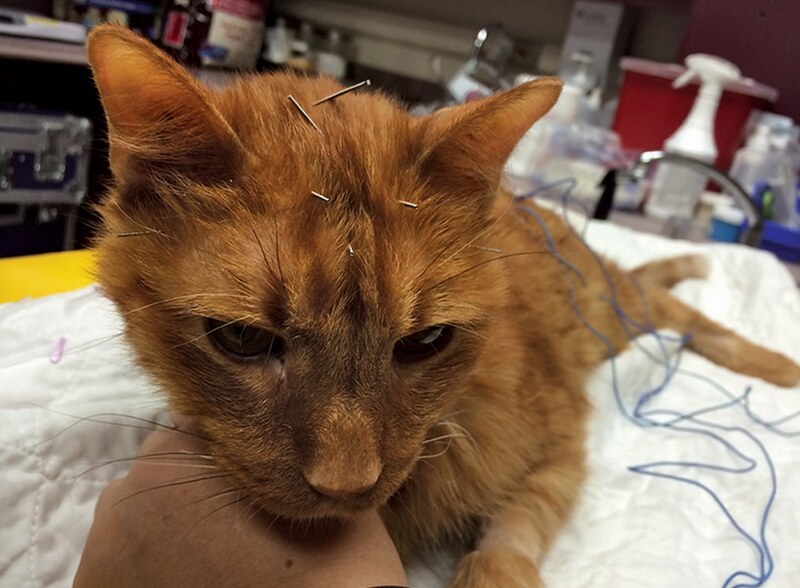 A cat receives electroacupuncture stimulation for osteoarthritis and diffuse muscle atrophy. The electrical stimulation of acupuncture needles may increase the analgesic effects of the treatment. 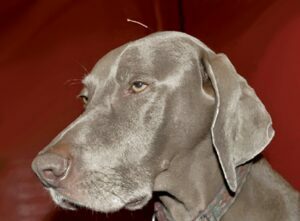 Medical Acupuncture for Veterinarians, onehealthsim.org. These certifications are issued by private organizations and are not regulated. Tuition costs for the training programs listed above range from approximately $6000 to $8500. The AVMA does not regulate acupuncture certifications as they do with specialty board certifications, such as surgery or internal medicine. Staffing. Acupuncture can be offered without additional staffing. Acupuncture needles are generally left in situ for 15 to 30 minutes, during which time a practice may or may not have a staff member with the patient and client. Most practices reserve a room for clients to relax with their pets after needle placement by the veterinarian. Patient & Client Population. In small animal practices, acupuncture is most commonly employed for osteoarthritis and intervertebral disk disease.7 Therefore, small animal practices with a large geriatric pet population will likely support an acupuncture caseload if the clinic staff and veterinarians are proactive in offering the service. Practices with a rehabilitation or pain management focus will also likely derive benefit. Acupuncture anecdotally appears most successful in practices with longer appointment times and clients residing in certain geographic locations (eg, urban areas, East and West coasts). Clients will often need to return at a routine interval for regularly scheduled follow-up treatments, and these visits may increase the client’s bond to the veterinarian. Practices should be prepared to have a room occupied for 40 to 45 minutes. This may be disruptive if it exceeds the average appointment time or if examination rooms are limited. Additionally, many practices use more comfortable furniture and examination areas for acupuncture rooms given that both patient and client will be relaxing during needle administration. Summary. Acupuncture provides adjunctive treatment for management of chronic musculoskeletal and neurologic abnormalities, with few significant costs apart from initial training. Local market demographics are likely to heavily influence success of acupuncture in any practice. The number of commercial manufacturers of pet foods and supplements is increasing, and owners frequently inquire about novel strategies for feeding, including frozen, raw, grain-free, organic, home prepared, and sustainable diets.17 Dietary supplements are administered by some owners and may include vitamins, minerals, antioxidants, essential fatty acids, food extracts, chondroprotectants, and herbal medications, among others. Guidelines for nutritional assessment have been published,18 and nutrition is a cornerstone of wellness examinations and programs. Discussion of nutrition with the client reinforces the veterinarian as the expert in this field and prevents nutritional outsourcing to other entities. Such discussions are likely to strengthen the owner–veterinarian bond, which has positive implications for the practice. Nutrition and nutraceuticals are extensively discussed in the articles, Novel Trends in Small Animal Nutrition: A Practical Guide (January/February 2013) and Surveying Supplements: Current Trends, Research, and Recommendations (May/June 2014), available at tvpjournal.com. Vasodilation as a result of nitric oxide release from proteins. The clinical effects on increased dermal healing are well established in other animal models and in humans.20,21 The effects on tendons and osteoarthritis are mixed or unclear. Few clinical trials in dogs or cats have been performed. A postoperative protocol for dogs after decompressive hemilaminectomy documented decreased time to ambulation.22 The benefits in other conditions are unclear. The potential side effects at high doses include thermal burns and cellular apoptosis, and the optimal doses for most conditions are not yet established. Training. Laser manufacturers typically provide training to the purchasing veterinary practice. For example, the American Institute of Medical Laser Applications (aimla.org) provides additional training on laser theory, types, and protocols. Independent training may be provided by rehabilitation and sports medicine training programs and continuing education conferences. Staffing. Veterinary technicians can be trained to provide laser therapy based on the attending veterinarian’s prescription. Knowledge of anatomy and laser principles is helpful. Patient & Client Population. Therapeutic lasers are used most frequently for wound or incisional healing, osteoarthritis, soft tissue injury (tendon, ligament), and intervertebral disk disease. There is likely significant overlap with the patient population for which acupuncture and rehabilitation is suitable. Some practices use laser therapy on all cases postoperatively to increase their laser caseload and return on investment. Facilities & Equipment. The cost of a laser is generally proportional to its power. Lower-powered lasers (class IIIb, Figure 3) may be purchased for around $5000, whereas those with a higher power (class IV) range upwards of $20,000. The power (W) describes the amount of energy (J) delivered over time (s). A higher-powered laser can deliver a dose of photonic energy in a shorter period of time, saving labor costs. The benefits of low-power versus high-power lasers are heavily debated. Practices will require a significant laser caseload to achieve an adequate return on investment with most class IV lasers. FIGURE 3. 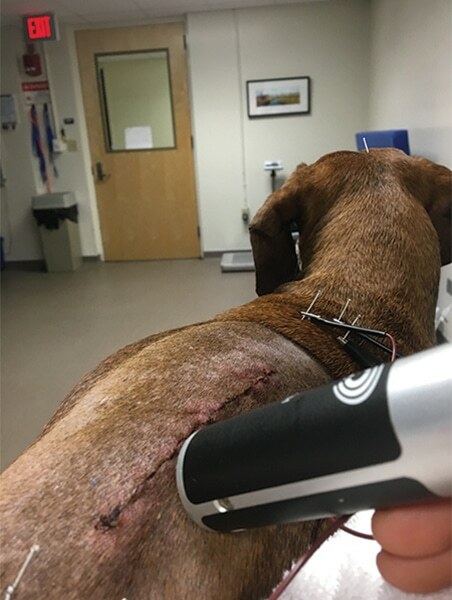 A dachshund receives class IIIb laser therapy and electroacupuncture 24 hours after a hemilaminectomy for intervertebral disk protrusion. Summary. Laser energy exerts potentially advantageous cellular effects. The precise dose needed in the treatment of veterinary patients to reach targeted cells remains unknown for most conditions, and only limited clinical trials are available. Practices should carefully evaluate their potential caseload before committing to an expensive laser. FIGURE 5. 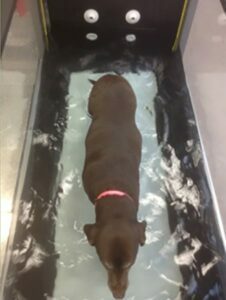 A geriatric Labrador retriever with diffuse osteoarthritis walks on an underwater treadmill, which provides exercise and muscle conditioning with reduced weight-bearing. Training. Two training certifications are presently available for canine rehabilitation: one offered by the University of Tennessee Rehabilitation program (ccrp.utvetce.com) and another by the Canine Rehabilitation Institute (caninerehabinstitute.com). Cost of tuition ranges from $5000 to $6500. Certification is available for veterinarians, veterinary technicians, and physical therapists. Similar to acupuncture training, certification is not legally required to incorporate rehabilitation modalities into a clinical practice. Specialist certification is regulated by the American College of Veterinary Sports Medicine and Rehabilitation (vsmr.org) and requires considerable practice experience or residency training. Staffing. Rehabilitation is labor intensive and veterinarians will be unable to charge effectively for their time if they are performing the modalities themselves. As a result, a trained and dedicated technician is necessary in most practices. 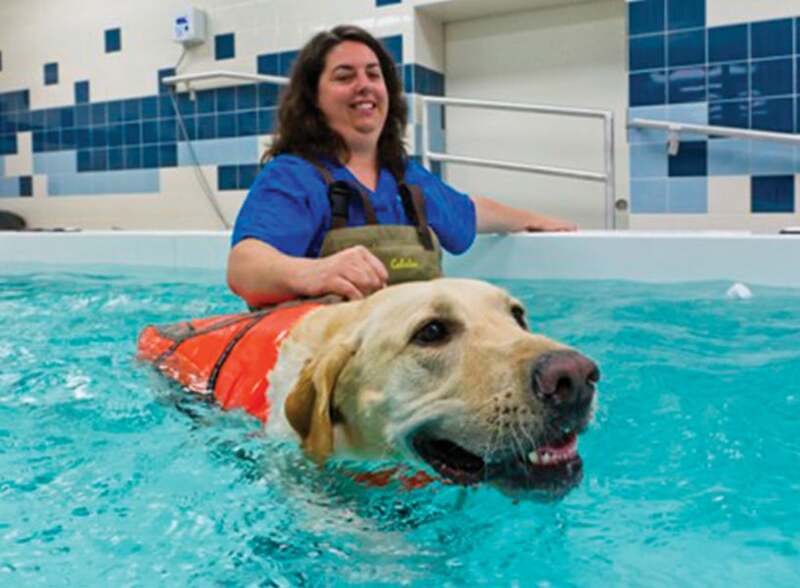 Two to three rehabilitation technicians are utilized for every evaluating veterinarian in many dedicated rehabilitation programs. Patient & Client Population. Practices with a robust orthopedic surgery caseload and/or sports medicine patients are most likely to benefit. Rehabilitation can also be of value in geriatric and neurologic patients, but the caseload may be insufficient if reliant on this population alone. Most clients who invest in surgical repair of an injury, or who prefer to avoid surgery, appear willing to pay the comparatively low cost for rehabilitation. Many clients are receptive to a fee structure in which individual modalities are included in a package price rather than itemizing specific charges for each intervention, which also avoids any appearance that items are being oversold to increase clinic production. Facilities & Equipment. The breadth of rehabilitation services offered is directly related to the initial costs. Many rehabilitation techniques require sufficient space, and an area of about 500 square feet is the suggested minimum if active exercises are performed. This space requirement can be a challenge for existing practices, most of which were not designed with rehabilitation in mind. Passive modalities can be provided with less space, but this may limit the type of cases that can be managed. Equipment costs vary considerably based on the modalities offered. Table 2 provides a list of equipment and suggested applications. Summary. Rehabilitation medicine incorporates many different therapies and can be tailored to the practice. However, dedicated technical staff will be required, and sufficient caseload is best achieved with an existing population of geriatric, performance, or postsurgical patients. Evidence. A patient’s endogenous cells can be harvested, processed, and then employed to stimulate tissue repair and to reduce inflammation. The primary regenerative veterinary medical techniques are platelet therapy and stem cell therapy. The hemostatic effects of platelets are well known, but platelets also contribute to cellular signaling, immunity, and tissue regeneration. The latter is primarily mediated by a number of growth factors found in alpha granules (Table 3).25 Dogs have shown clinical response when treated with platelet products for osteoarthritis, postoperative cranial cruciate ligament rupture, and tendinopathy, although such studies are preliminary and often characterized by low study numbers and lack of a control group.26-28 Moreover, studies in other species have been mixed. FIGURE 6. 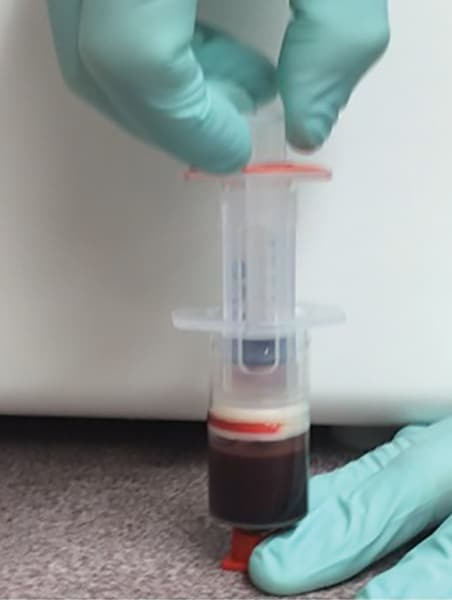 Multiple systems are available to extract platelet containing plasma from a patient’s blood. The system shown here uses a double-barreled syringe and a specific centrifugation technique. Autologous stem cells are typically processed from adipose tissue, obtained from surgical collection of falciform ligament or subcutaneous fat, and variably described as mesenchymal or adipose-derived stem cells. These cultured multipotent cells can then theoretically differentiate into adipocytes, chondrocytes, or osteoblasts. Training. Most platelet products can be processed in-house with minimal additional training beyond the information provided in product instructions. Autologous stem cells require surgical biopsy and processing by an outside laboratory. Intra-articular injection of both products requires knowledge of basic musculoskeletal anatomy. Staffing. Additional staffing is not required. Patient & Client Population. Practices with a geriatric, sports medicine, orthopedic surgery, or rehabilitation caseload have the best opportunity to use these techniques. The cost of platelet processing and injection to the client will be greater than $150, and the cost of stem cell injections is generally greater than $1000 per dose. Facilities & Equipment. Platelet processing requires centrifugation equipment obtained from the manufacturer of the separation system. Stem cell processing is typically done off-site. The initial investment in equipment is low, so these therapies can be offered on an intermittent basis. Summary. Regenerative medicine is a growing area within integrative therapeutics. Clients find the concept of promoting endogenous healing to be appealing, but treatments are more expensive than other interventions. Practices with other integrative modalities are best positioned to use these treatments given the overlap in indications for this and other techniques. Evidence. 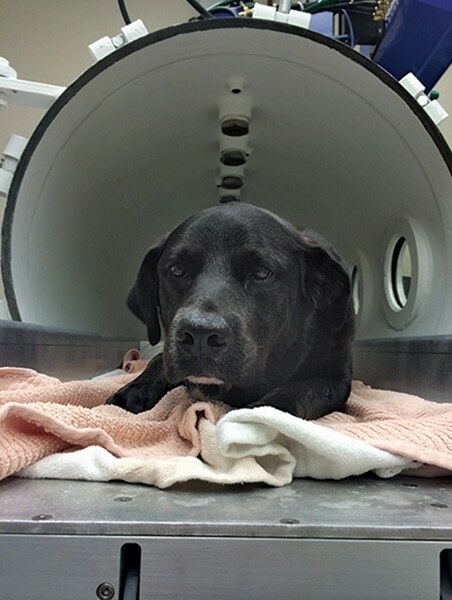 Hyperbaric oxygen chambers (Figures 7 and 8) have been extensively studied and utilized in human medicine, but two of the most common applications in human health—decompression sickness and carbon monoxide toxicity—are rarely encountered in veterinary patients. However, they are also approved in humans for treatment of extensive wounds and burns, radiation injury, refractory osteomyelitis, compartment syndrome, and severe anemia. Hyperbaric chambers are used clinically, but not approved, for spinal and head trauma and stroke. FIGURE 7. A young German shepherd is treated with a session of hyperbaric oxygen for oomycosis. FIGURE 8. 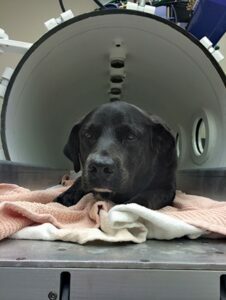 Most veterinary hyperbaric chambers can accommodate all but the largest of canine patients, and most sessions last 1 to 2 hours. Post-treatment vasodilation due to nitric oxide release. Veterinary research studies are mixed regarding effects of hyperbaric oxygen. Experimental studies in cats demonstrated positive effects on wound healing of skin flaps but minimal effects on short-term fracture healing.36,37 A standardized treatment protocol for dogs was shown to be well-tolerated in a clinical rehabilitation center, and oxygen toxicity—characterized by intrasession seizures and reported in many species, including humans and dogs—was not observed.38 The most common conditions treated included intervertebral disk disease and extensive wounds, although efficacy was not reported. Training. The manufacturers of chambers provide initial training. There are independent organizations that certify hyperbaric technicians for human medical practice. 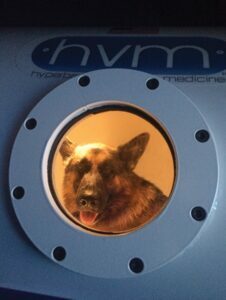 A certified hyperbaric technologist program for veterinary staff is now available from several continuing education providers (nbdhmt.org/chtv.asp). Specific guidelines for safe chamber use must be rigidly followed because oxygen chambers can be the source of injury or death, as was the case when an equine unit exploded in a private rehabilitation center in Florida. Adverse events of this severity have not been reported with small animal chambers, but veterinarians should discuss safety and liability with the chamber manufacturer. Staffing. Hyperbaric chamber sessions require constant monitoring and, therefore, a dedicated hyperbaric technician is required unless the chamber is installed in a central treatment area where observation will be constant. Patient & Client Population. Hyperbaric oxygen sessions are generally reserved for severe injuries, and only those facilities with a large emergency caseload or specialty referral population are likely to support the costs and technical staff required. Hyperbaric chamber sessions are charged at an average rate of approximately $150 per hour in the Southeast United States and, therefore, practices that can support a hyperbaric chamber are likely to be those with a higher average transaction charge. Facilities & Equipment. Used or new hyperbaric oxygen units manufactured for humans can be purchased for animal use, while veterinary-specific hyperbaric chambers are available from Veterinary Hyperbaric Oxygen (vhbo2.com) and Hyperbaric Veterinary Medicine (hvmed.com). Companies may provide lease options to reduce initial costs, but modification of an existing building is required to provide a true earth ground, an outside exhaust line, and dedicated oxygen input. The outright purchase cost of a hyperbaric chamber is quite variable, and veterinary manufacturers either exclusively lease or do not provide exact costs publicly. Human hyperbaric chambers start at around $75,000 for a reconditioned unit that is about 10 years old. New units with advanced monitoring and/or safety features for human practice may cost more than $150,000. Summary. Only several hyperbaric chambers were in use for small animals nearly a decade ago, but now dozens of chambers have been installed in large practices in the U.S. The hyperbaric veterinary field is expected to continue to grow, but practices should carefully evaluate whether there is adequate caseload to justify the operating and startup costs. Moreover, additional information is required to better refine the clinical benefits of hyperbaric oxygen. Integrative medicine has experienced significant owner-driven growth. As a result, it is unlikely the profession will witness a reduction of these therapies in the future. Clients are increasingly searching for comprehensive treatment protocols, and clinics that can provide the best combination of therapeutic modalities are likely to improve market share and patient care. Practices investing in one or more integrative modalities now are also likely to gain the experience necessary to adapt to future trends and implement the best evidence-based complementary approaches with conventional care. In the future, and as additional research becomes available, many therapies considered “outside mainstream treatment” today will likely become standard treatment in the future and provide a critical component of veterinary care. AVMA. US Pet Ownership and Demographics Sourcebook. Schaumburg, IL: American Veterinary Medical Association, 2012. Memon MA, Sprunger LK. Survey of colleges and schools of veterinary medicine regarding education in complementary and alternative veterinary medicine. JAVMA 2011; 239:619-623. Ernst E. The public’s enthusiasm for complementary and alternative medicine amounts to a critique of mainstream medicine. Intl J Clin Pract 2010; 64:1472-1474. Frass M, Strassl RP, Friehs H, et al. Use and acceptance of complementary and alternative medicine among the general population and medical personnel: A systematic review. Ochsner J 2012; 12:45-56. King N, Balneaves L, Card C, et al. Surveys of cancer patients and cancer care providers regarding complementary therapy use, communication and information needs. J Altern Complementary Med 2014; 20:A98-A98. Lana SE, Kogan LR, Crump KA, et al. The use of complementary and alternative therapies in dogs and cats with cancer. JAAHA 2006; 42:361-365. Marks D, Shmalberg J. Profitability and financial benefits of acupuncture in small animal private practice. Am J Trad Chin Vet Med 2015; 10. Shmalberg J. Acupuncture: History and application. Clin Brief 2014:59-61. Kim MS, Seo KM. Effects of atipamezole and naloxone on electroencephalographic spectral edge frequency 95 in dogs sedated by acupuncture at GV20 and Yintang point. J Vet Med Sci 2007; 69:577-579. Choi M, Jung J, Seo M, et al. Ultrasonographic observation of intestinal mobility of dogs after acupunctural stimulation on acupoints ST-36 and BL-27. J Vet Sci 2001; 2:221-226. Koh RB, Isaza N, Xie H, et al. Effects of maropitant, acepromazine, and electroacupuncture on vomiting associated with administration of morphine in dogs. JAVMA 2014; 244:820-829. Ulett GA, Han S, Han J-s. Electroacupuncture: Mechanisms and clinical application. Biol Psychiatry 1998; 44:129-138. Kapatkin AS, Tomasic M, Beech J, et al. Effects of electrostimulated acupuncture on ground reaction forces and pain scores in dogs with chronic elbow joint arthritis. JAVMA 2006; 228:1350-1354. Hayashi AM, Matera JM, de Campos Fonseca Pinto ACB. Evaluation of electroacupuncture treatment for thoracolumbar intervertebral disk disease in dogs. JAVMA 2007; 231:913-918. Habacher G, Pittler MH, Ernst E. Effectiveness of acupuncture in veterinary medicine: Systematic review. J Vet Intern Med 2006; 20:480-488. Shmalberg J, Burgess J. A randomized controlled blinded clinical trial of electro-acupuncture administered one month after cranial cruciate ligament repair in dogs. Am J Trad Chin Vet Med 2014; 9:43-51. Shmalberg J. Novel trends in small animal nutrition: A practical guide. Today Vet Pract 2013; 3:38-45. Chung H, Dai T, Sharma S, et al. The nuts and bolts of low-level laser (light) therapy. Annal Biomed Engineer 2012; 40:516-533. Peplow PV, Chung T-Y, Baxter GD. Laser photobiomodulation of wound healing: A review of experimental studies in mouse and rat animal models. Photomed Laser Surg 2010; 28(3):291-325. Pereira da Silva J, Alves da Silva M, Figueiredo Almeida AP, et al. Laser therapy in the tissue repair process: A literature review. Photomed Laser Surg 2010; 28(1):17-21. Draper WE, Schubert TA, Clemmons RM, et al. Low-level laser therapy reduces time to ambulation in dogs after hemilaminectomy: A preliminary study. J Small Anim Pract 2012; 53:465-469. Marsolais GS, McLean S, Derrick T, et al. Kinematic analysis of the hind limb during swimming and walking in healthy dogs and dogs with surgically corrected cranial cruciate ligament rupture. JAVMA 2003; 222:739-743. Monk ML, Preston CA, McGowan CM. Effects of early intensive postoperative physiotherapy on limb function after tibial plateau leveling osteotomy in dogs with deficiency of the cranial cruciate ligament. Am J Vet Res 2006; 67:529-536. Lana J, Weglein A, Vicente E, et al. 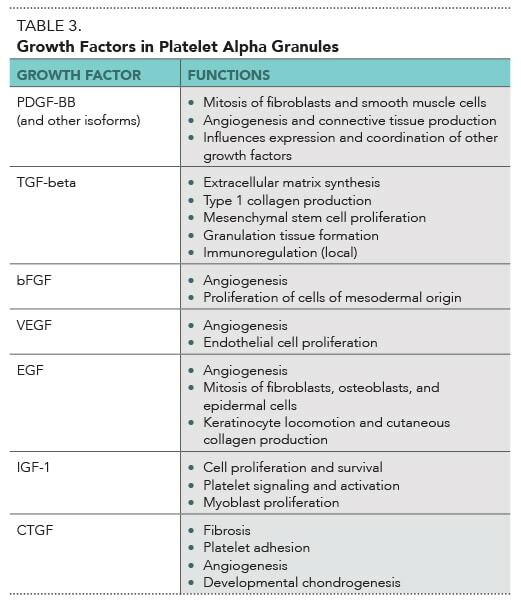 Platelet rich plasma and its growth factors: The state of the art. In Lana JFSD, Andrade Santana MH, Dias Belangero W, et al (eds): Platelet-Rich Plasma. Heidelberg, Germany: Springer Berlin Heidelberg, 2014, pp 1-59. Ho LK, Baltzer WI, Nemanic S, et al. Single ultrasound-guided platelet-rich plasma injection for treatment of supraspinatus tendinopathy in dogs. Can Vet J 2015; 56:845-849. Fahie MA, Ortolano GA, Guercio V, et al. A randomized controlled trial of the efficacy of autologous platelet therapy for the treatment of osteoarthritis in dogs. JAVMA 2013; 243:1291-1297. Silva RF, Carmona JU, Rezende CM. Intra-articular injections of autologous platelet concentrates in dogs with surgical reparation of cranial cruciate ligament rupture: A pilot study. Vet Comp Orthop Traumatol 2013; 26:285-290. Franklin SP, Garner BC, Cook JL. Characteristics of canine platelet-rich plasma prepared with five commercially available systems. Am J Vet Res 2015; 76:822-827. Vilar JM, Batista M, Morales M, et al. Assessment of the effect of intraarticular injection of autologous adipose-derived mesenchymal stem cells in osteoarthritic dogs using a double blinded force platform analysis. BMC Vet Res 2014; 10:143. Cuervo B, Rubio M, Sopena J, et al. Hip osteoarthritis in dogs: A randomized study using mesenchymal stem cells from adipose tissue and plasma rich in growth factors. Int J Mol Sci 2014; 15:13437-13460. Whitworth DJ, Banks TA. Stem cell therapies for treating osteoarthritis: Prescient or premature? Vet J 2014; 202:416-424. Thom SR. Hyperbaric oxygen: Its mechanisms and efficacy. Plast Reconstr Surg 2011;127:131S-141S. Simpson D. Hyperbaric oxygen therapy part one: The theory behind the practice. Aust Vet Pract 2009; 39:93-101. Edwards ML. Hyperbaric oxygen therapy. Part 1: History and principles. J Vet Emerg Crit Care 2010; 20:284-288. Kerwin SC, Hosgood G, Strain GM, et al. The effect of hyperbaric oxygen treatment on a compromised axial pattern flap in the cat. Vet Surg 1993; 22:31-36. Kerwin SC, Lewis DD, Elkins AD, et al. Effect of hyperbaric oxygen treatment on incorporation of an autogenous cancellous bone graft in a nonunion diaphyseal ulnar defect in cats. Am J Vet Res 2000; 61:691-698. Shmalberg J, Davies W, Lopez S, et al. Rectal temperature changes and oxygen toxicity in dogs treated in a monoplace chamber. Undersea Hyperb Med 2015; 42:95-102. Justin Shmalberg, DVM, Diplomate ACVN & ACVSMR, is a clinical assistant professor and service chief of integrative medicine at University of Florida College of Veterinary Medicine. He received his DVM from University of Wisconsin–Madison and completed an internship in veterinary acupuncture at University of Florida, along with a residency in small animal clinical nutrition.from University of Florida and completed a radiology residency at University of California–Davis.